Doubling elective surgery waiting times. 8.1 As outlined in Chapter 3, the Parliamentary Budget Office's (PBO) submission provided a detailed state-by-state breakdown of the difference in Commonwealth hospital funding between the government's policy announced in the 2014‑15 Budget and the former government's hospital funding arrangements under the National Health Reform Agreement 2011. The government's 2014‑15 Budget marked a fundamental policy shift away from the previous government's activity based funding model, which established a national efficient price for hospital services. Instead, it reverts to the former block funding model based on CPI and population growth. 8.2 The PBO calculates that South Australia will receive $4.2 billion less in hospital funding from the Commonwealth over the period 2014-15 to 2024-25 than if hospitals were funded according to the 2011 agreement. The annual funding differences are set out in Appendix 4. 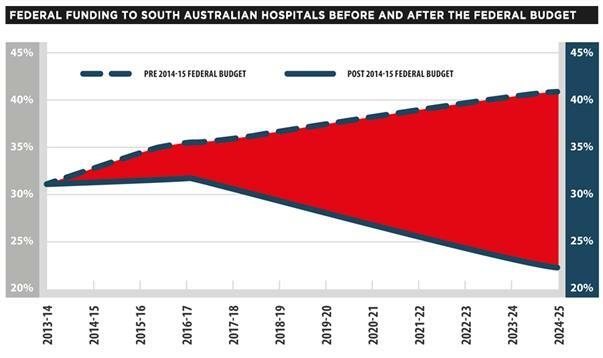 8.3 Consistent with PBO figures, South Australian (SA) public hospital services would see 'a loss of around $4.6 billion over the next 10 years' as a result of the 2014‑15 Budget, according to the SA Government's submission. $42 million from the National Partnership Agreement on Financial Assistance for Long-stay Older Patients. 8.6 Figure 3 below shows the difference in funding for South Australian hospitals between the AHRA and the 2014-15 Budget. The South Australian Government has demonstrated a strongly collaborative approach to national health reforms and has been disappointed at the Commonwealth reneging on its commitments under the National Health Reform Agreement and associated National Partnership Agreements. It was a shock to every minister, chief minister and first minister around the table. I think I speak for all of them when I say that they were angry about the fact that they had been misled in that way. At its very lowest, it was misleading to have a briefing about the budget and not flag such dramatic changes that were on the way. 8.9 The SA Government submitted that the end of the 2011 agreement would increase the 'potential for cost-shifting' between the Commonwealth and states and territories. The submission highlighted that the Commonwealth's contribution to national hospital funding would reduce from 31 per cent in 2014-15 to 23 per cent in 2024-25, whereas the 2011 agreement had aimed to 'gradually increase the Commonwealth share of hospital funding to 50 per cent'. ...does not fully address the expected growth in public hospital expenditure, taking into consideration population growth and the ageing of the population, health CPI and increased costs for medical technology. 8.11 The end of funding under the National Partnership Agreement on Improving Public Hospital Services was regarded by the SA Government as a significant departure from earlier agreement. Despite not meeting emergency and elective surgery targets, the committee heard that 'South Australia expected to continue to receive reward funding acknowledging its significant efforts against these ambitious targets for the remaining two years'. It was submitted that the Commonwealth was incorrect in treating '[a]ny failures... to meet the targets' as 'a breaking of the agreement'. Careful consideration of the impacts of primary health care services, preventive health and high quality aged care and disability services... on the demand for public hospital services. Over the last few months we have seen the queuing of ambulances at the Royal Adelaide Hospital, as the public hospital system has exceeded capacity. Patients have been triaged by Emergency Department staff whiles still in ambulances, in the hospital car park. Also of concern are the continuing reports of mental health patients being held in Emergency Departments for many days, being isolated in windowless rooms, physically and chemically restrained. This has all occurred prior to the impact of the Commonwealth Government’s 2014 Budget cuts being felt. SA Health modelling shows the average emergency department wait times in South Australia are likely to increase to at least 66 minutes - up from the average current 20 minute waiting time. It is estimated that acuity (or complexity of illness) would increase as public hospitals triage cases as normal – but under greater financial constraints. This would cause the less complicated cases (e.g. dental extractions, other knee procedures) to seek out the private system. This would in turn leave the more complicated cases (liver and heart transplants) inside the public system. 8.16 Premier Weatherill summarised that '[b]y 2019-20, more than 56,000 patients per year will be left untreated in the public system, growing to more than 107,000 patients per year by 2024-25'. ...it is reasonable to expect that if Commonwealth funding had continued that further improvements to waiting times could have been made... The South Australian government had made a commitment to deliver a new strategy to keep waiting times low and focus on areas of growing demand over the next four years. 8.18 Faced with more patients and more acute cases, hospitals in SA could be less prepared to treat them, as the state would 'have difficulty adopting new and more expensive life-saving technology'. 8.19 Hospital redevelopment was also slowed by the 2014-15 Budget, with the SA Government submitting that it had suspended projects at the Queen Elizabeth Hospital (stage 3A), Modbury Hospital, Noarlunga Health Service (stage 2A) and Flinders Medical Centre, redirecting funding into a 'Health Capital Reconfiguration Fund'. In our State Budget we have committed to make up for half of the cuts with the removal of the emergency services rebate and other income measures. But a shortfall of $332 million still remains. 8.21 Before the Council of Australian Governments met in April 2016, Premier the Hon Jay Weatherill reiterated that 'the states and territories simply cannot afford to bear the brunt of these cuts'. 8.22 The committee commends the SA Government for refusing to pass on the most immediate impacts of the Federal Government's funding cuts to public hospitals across the state, but notes that the shortfall in funding remains considerable. 8.23 SA public hospitals must be supported in their efforts to reverse worrying trends in the length of waiting times and the number untreated patients. In 2016, SA was one of only two states (along with Tasmania) assessed as not meeting any targets in the Australian Medical Association's Health and Hospitals Report Card 2016. Particularly concerning for the committee was the marked decrease in the number of SA urgent emergency department patients seen within the recommended time, falling from 70 per cent in 2011‑12 to approximately 58 per cent in 2014-15. 8.24 The committee believes that state and territory governments cannot continue to cover the Commonwealth's planned funding reductions, which will grow steadily over time to a total of $4.2 billion by 2024-25. 8.25 Long term funding certainty allows for better planning for infrastructure, managing staffing, waiting times and lists, and delivers increased efficiencies overall. When hospitals are forced to operate on year-to-year budgets, there is no capacity for planning ahead and making efficient investment in staff and services. 8.26 The committee believes that without long term funding, state and territory public hospitals will not be able to achieve efficiencies and adequately serve Australians. The committee calls on the Federal Government to create a long term, sustainable, funding model for hospitals which allows for appropriate contributions from governments, both state and federal.